The P.Audio has redefined its BM series of compression drivers. The BMD460S is a state of the art high output compression driver. New developments P.Audio Research and Development have produced new levels of performance. State of the art manufacturing methods insure extremely reliable and consistent designs. The new BM-D460S driver utilizes the recently developed CRT™ technology to substantially improve both the time domain response and reduce distortion through the critical upper vocal range (1.5kHz to 5kHz). This new technology, called Cavity Resonance Technology ™ (CRT) acts to acoustically minimize the cavity found under all suspension driver suspension elements. By employing CRT technology, P.Audio engineers have been able to greatly improve the vocal accuracy in the frequency range where vocal intelligibility is located. Magnetic fluid has also been added to increase thermal transfer and mechanical damping. These changes to the diaphragm and magnet structure assembly have also increased the sound pressure levels and smoothed the response between 10kHz and 20kHz. The result is a more accurate system, particularly for vocal range program material. The BM-D460S is a medium format titanium based diaphragm assembly mated to a close spaced circumferential phase plug geometry. The voice coil is a rectangular geometry, high temperature aluminum to insure extended high frequency response. This diaphragm geometry is ideally suited for foreground/background high performance pa systems. The 1.0 inch (25.4mm) throat exit makes the 460S an excellent choice for extended bandwidth and ultra high frequency applications such as three way designs. The BM-D460S is ideally suited for line array applications or other applications where a mid bass horn or direct radiator driver is also used. This medium format throat and medium format diaphragm insures wide dispersion at very high frequencies and is an excellent choice for three way systems or medium power two way designs. The 1.0 inch throat is compatible with a variety of P.Audio horns and also compatible with industry standard 1.0 inch screw/thread on horns. The Ferrite based permanent magnetic system produces a very high efficiency and value. 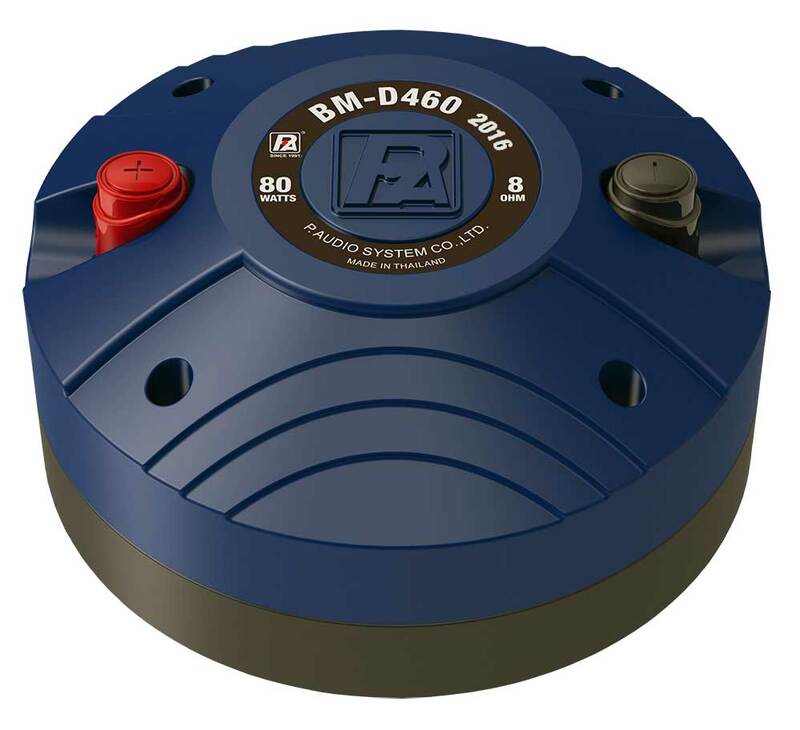 This makes the BM-D460S ideal for professional applications as well as fixed installation systems. The large format Ferrite permanent magnet produces a very high conversion efficiency.